Hood’s Gardens Inc. and our customers are linked together for mutual success. This is an important connection of ideas and goals to promote success for you, our customers and for us, your grower. Our personal goals are our overall quality of our products and service to you our customer to achieve that mutual success. The production for the landscape trade is grown on commitment. The plant material needed by the landscaper is ordered in advance and we strive to grow the variety requested, the size container desired and the number needed for the customer. We enjoy forming a lasting relationship with our customers and getting to know their wants and needs to assist in designing successful projects. We are willing to sit down with our customers if advice or assistance is desired to help plan for successful flower beds. Most production for the landscape trade is grown in 1801 size landscape trays. These are bedding plant flats that hold 18 plants and do not have an insert. The plants are grown directly in the flat. This results in plants that can be popped out by pushing on the bottom bubble. Planting can be done faster with the use of landscape trays. With these trays there are no plastic inserts to blow around or dispose of. For us to custom grow what is desired by our customers, orders need to be placed with us far enough in advance to allow time to sow the seed and grow the plants. This date is our DESIRED DATE (DD) to receive the orders. Orders will be accepted after these dates only if time allows to produce the crop for your planting schedule. We ask that orders be placed through your landscaper account or via email. Without our customers, we would not be able to grow all of the plants that we do. It is because of our relationship with you that we can form mutual success for all. To the left is the new Muffin Pan Tray. A 5" diameter potless root ball is contained in each cell. These trays are about the same depth as a traditional 1801, but with more soil volume and space. 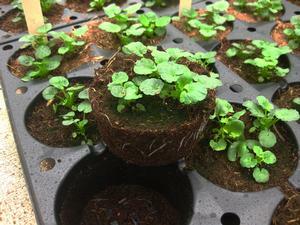 This allows production of a bigger plant - these can be substituted for either 4.5 inch pots or 6 inch pots. There is less waste with no pots blowing around, and used trays stack just as 1801's do for recycling purposes. New varieties for 2018 flower projects! To be filled out and filed with the state of Indiana. An approved copy must be submitted to Hood's Gardens.